Photo: Children of our current weekly outreach will now be among the candidates to attend the new Children’s Hope Center education program on Cebu. In some good news coming from our Philippines team, we are in the planning stages of starting a Children’s Hope Center program on the island of Cebu. The Children’s Hope Center model was first established in 2011 by our India team, comprised of after-school care programs such as tutoring, computer education and with snack and meal services for children suffering from extreme poverty. The program model has proven highly effective; this will be our 5th Children’s Hope Center launch. We do not have a designated building for the Cebu Hope Center at this time, so the program will be held in an existing shelter on our main campus. Our native team will bring the children to the shelter after their classes at school and give them a nutritious hot meal, assist them in completing their homework, nurture and guide them on how to live in a suitable manner that blesses their local community and teach them to value their neighbors, boost their self-confidence, and provide them with all the necessary supplies that their schools require. With your support we hope to raise an additional $840.00 in monthly contributions. When coupled with our farmland profits, this amount will cover the launch of the Children’s Hope Center program. This budget will take care of the children’s educational needs, including the ability to hire a permanent teacher and a driver. We also seek $10,000 for a minibus to safely transport the children from school to the Hope Center and back to their families’ homes at the end of the day. By keeping the children successfully enrolled in school we can give them much better chances of breaking out of the cycle of extreme poverty, avoiding the perils of child labor and keeping them safe from the dangers of human trafficking. We anticipate that our capacity in the first phase of launch will be about 20 children. Photo inset: (Top-left): Children on the island of Cebu wait expectantly for a hot meal consisting of food from our native team’s farmland. (Top-right): Our Philippines team is thankful for an abundant harvest from their banana grove. 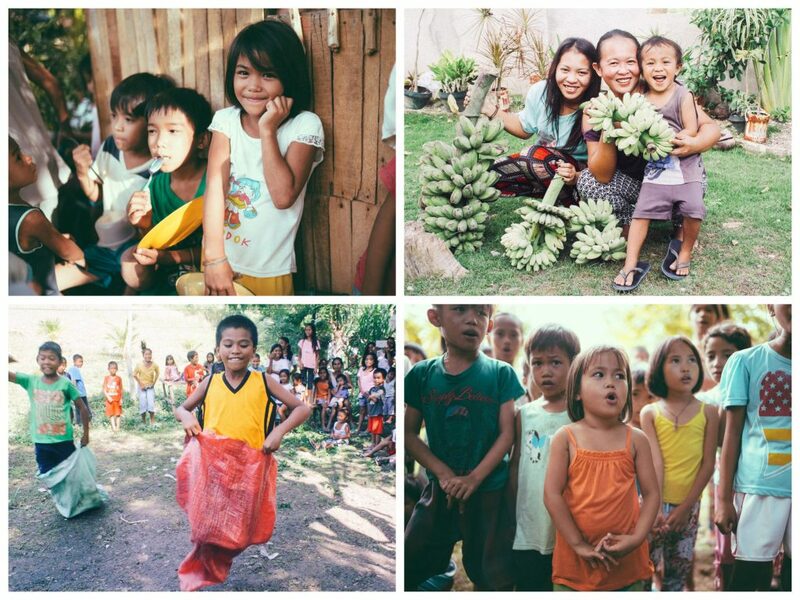 (Bottom-left): Cebu children play games at a Christmas party held by our native team. (Bottom-right): Children at our VBS-style outreach enjoy singing songs led by our local team. We are thankful for our current stock of approximately 8,000 healthy fish at our fishery thanks to 7 new aerator units that we were able to add to our aeration system, which continue to work efficiently at our fishery on the island of Cebu. The new tank has increased our water flow which supplies the fishery, and it also provides clean baths for the children, aiding their hygiene and health. Water for the fishery is continually aerated and supplied with fresh water from a pure aquifer using our own well, reducing the chances of fish contamination to almost nil. We have both fingerlings and medium-sized fish in our second pond that are separated and then returned to the larger pond after harvest of the mature fish. Another harvest is expected in about 6 months time. The supply of fresh fish vastly supplements the nutrition of our students and children in our outreach programs. In pursuit of our sustainability goals, our team has maintained a hen house project which currently contains 147 hens that produce around 124 eggs per day. We expect production to increase as this new batch of young hens matures. We recently improved our hen house project by installing a double net to cover the entire building to prevent small animals or birds from entering the hen house and eating our eggs. We have also been maintaining a banana grove consisting of 60 trees that yield over 6,000 bananas a year, and a garden where we are currently growing eggplant, spinach, okra, tomatoes, and ginger. Our entire farmland enterprise is working well along with our two fishery ponds. The main concrete-lined pond holds a volume of approximately 20,000 gallons (75,000 liters) of fresh water pumped from our on-campus well. 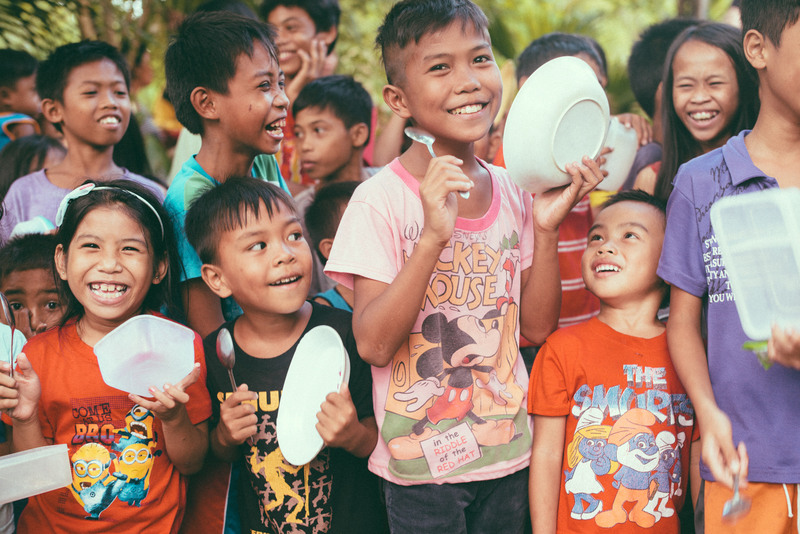 All of these efforts not only aid in providing nutritious ingredients for our children’s meals, they also help diversify and increase profits, empowering our local team to reach even more children. We are also happy to report that on December 24, 2015, our native team threw a Christmas party for more than 200 children in our programs. The children enjoyed a special feast of roasted pork and orange juice, each child received a gift, and they played games such as sack races, tomato dances, and apple eating contests, among others. The children were very blessed and happy to experience a Christmas party— for many it was the first such party they’d ever been to. The celebration gave them a lot of hope for their well-being in the new year.